December 10, 2010  Clinton said the tax cut compromise was the best bipartisan deal Obama could get. He said its passage was critically important to keep the economy from sliding back into recession. December 6, 2010  Kennedy still gets the highest approval ratings and Clinton and Bush the elder's ratings have risen by 8 percentage points. 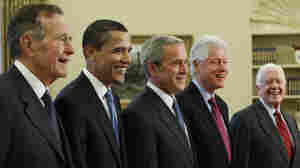 Jimmy Carter's approval rating fell by 9 percentage points, however, between 2006 and the recent survey. November 3, 2010  The release of Lil’ Wayne from Rikers Island prison Thursday has former President Bill Clinton eager for the young rapper to get on with his life. November 1, 2010  After a congressman's wife went into labor, Bill Clinton noted how often this happens to him, that a "very pregnant" woman he take a picture with goes into labor. 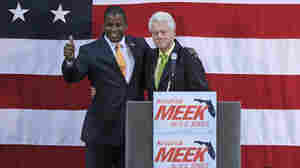 October 29, 2010  Still, Florida's Senate race has been roiled by the reports and some Democrats worry that the news could discourage or anger some African-American voters. Meek is black. October 15, 2010  On this date in 1992, President George Bush, Democratic challenger Bill Clinton and independent candidate Ross Perot hold their second debate, at the University of Virginia, a debate that used a "town hall" meeting format. October 14, 2010  ANALYSIS: The names are Obama and Clinton — three politicians who are monumentally ambitious in different ways, and one ongoing psychodrama for their party and country. 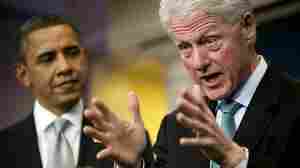 September 23, 2010  Former President Bill Clinton said Democrats should unveil their own national plan to give voters a choice between the Republicans Pledge to America and Democratic policies. 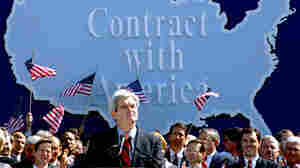 September 23, 2010  There is little hard evidence that the 1994 Contract with America contributed much to the wave that carried Republicans into power. But it did give House Republicans a checklist for how they would govern. September 8, 2010  Perhaps signaling a new tactic, President Obama criticized Rep. John Boehner by name, apparently deciding that the best way to deal with the GOP opposition was to personalize it in order to give voters a choice of personalities. June 29, 2010  Former President Bill Clinton has endorsed Andrew Romanoff for senator in the Colorado Democratic primary -- a move that puts him at odds with President Obama, who strongly backs appointed incumbent Michael Bennet.